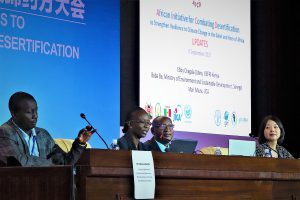 The UNCCD COP 13 Side Event of the African Initiative for Combating Desertification (AI-CD) to Strengthen Resilience to Climate Change in the Sahel and the Horn of Africa was held on September 8th 2017 at the Ordos International Convention and Exhibition Centre in Ordos, China. Around 80 people from various African countries (Cabo Verde, Chad, Cameroon, Kenya, Niger, Nigeria, Morocco, Senegal, Somalia, and Sudan), International Agencies (GEF, ICARDA, FAO, UNDP, etc. 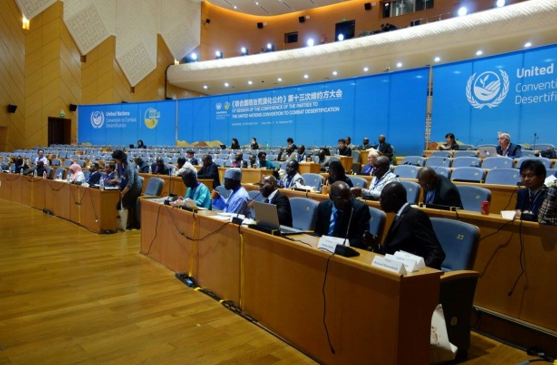 ), and other AI-CD or UNCCD COP 13 stakeholders attended the event, which ended with the announcement of the AI-CD main promotion instrument: the Ordos Roadmap. The side event had three primary objectives. The first one was for AI-CD participating countries and partner organizations to share their progress regarding the initiative. The second one was to discuss the way forward in further promoting partnerships and measures to address desertification, with a particular focus on the SDG 15.3 and other important goals. The last objective was to announce the Ordos Roadmap which aims to show further commitments and actions by African countries, partner organizations and other stakeholders. 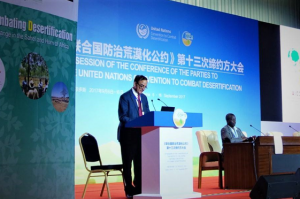 In his Key Note Speech, UNCCD Deputy Executive Secretary, Mr. Pradeep Monga, highlighted the importance of the AI-CD mission to protect the land, which is a precious asset for people’s livelihood. 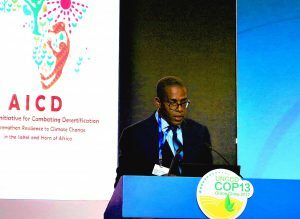 He also expressed his intention to support the AI-CD as a representative of the UNCCD, one of its main partner organizations. Warm words of welcome were given by Mr. Takahiro Morita, Senior Deputy Director General at the JICA Global Environment Department. He expressed JICA’s will to continue promoting their cooperation and support to the Sahel and the Horn of Africa in combating desertification. 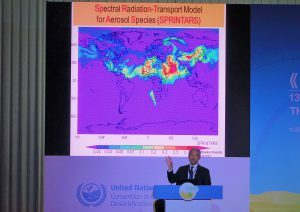 Mr. Morita ended his statement by introducing SPRINTARS (Spectral Radiation-Transport Model for Aerosol Species), a new sandstorm early warning system, which could greatly contribute to improving farming practices in areas frequently affected by sandstorms. The progress of AI-CD activities in participating countries was presented by Dr. Ebby Chagala from the Kenya Forestry Research Institute, representing the Horn of Africa, and Mr. Baba BA from the Ministry of the Environment and Sustainable Development in Senegal, representing the Sahel. In terms of progress, almost all participating countries had developed an AI-CD action plan, shared their knowledge, built networks, and discussed, during regional meetings, ways to access finance as well other challenges they had to solve in order to move the AI-CD forward. Progress made by partner organizations was presented by Ms. Mari Miura from JICA, who announced the opening of the AI-CD website, an interface for regional knowledge and experience sharing. Ms. Miura also reiterated JICA’s intention to continue supporting the AI-CD through the implementation of the TOR and capacity-building activities. Key questions for the Panel Discussion were the following: 1. What progress has been made to achieve SDG 15.3 and other important goals and what challenges are partner countries facing? 2.What are the opportunities the African Initiative provide to the Sahel and the Horn of Africa countries to address those challenges? 3.How can the countries and development partners work better under the African Initiative towards achieving SDGs? Four panellists were invited to express their views on the Key Questions: Dr. Haman Unusa from Cameroon, Dr. Abdelazim Mirghani Ibrahim from Sudan, Dr. Richard A. Byron-Cox, representing the UNCCD, and Dr. Richard Thomas representing ICARDA. The discussion mainly revolved around the numerous challenges faced by countries of the Sahel and Horn of Africa in their fight against desertification and land degradation. To address such challenges, the panellists emphasized the importance of collaboration and the need for synergy of action among AI-CD participating countries. 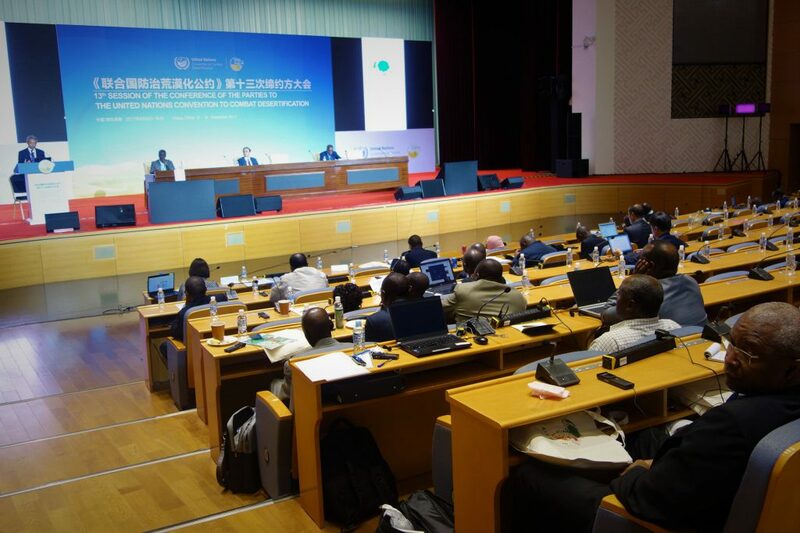 Furthermore, Moderator called African AI-CD countries to be more proactive in their initiatives and seek support from wider international development partners to support their efforts for combating desertification. 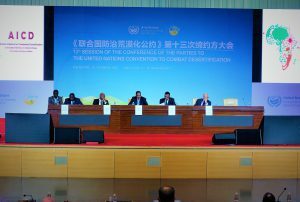 The spotlight was finally placed on the Ordos Roadmap, designed to facilitate further commitments and actions of African countries and also to garner support from partner organizations, as well as promote partnerships among stakeholders in combating desertification.